FHN offers a series of flu shot clinics each year, beginning in October. These clinics are open to the public and held at locations across northwest Illinois. Each year's schedule is announced in late summer. For more information, contact FHN Community Services at 815-599-7437 or email jroach@fhn.org. Meals on Wheels provides meals Monday through Friday to those with a physician's diet order who reside within Freeport city limits. A deposit equivalent to 2 weeks delivery is included in the application process. The meals include a choice of lunch and/or evening meal, both of which will be delivered around noon. The lunch is served hot and costs $4, and the evening meal is brought cold and costs $3. No deliveries are made on New Year's Day, Memorial Day, July 4, Labor Day, Thanksgiving Day, and Christmas Day. For more information, call 815-599-6148 or email kbrooks@fhn.org. Free, environmentally safe disposal of waste medications available through FHN and local law enforcement officials. For more information, contact the Freeport Police Department at 815-235-8222 or the Stephenson County Sheriff's Department at 815-235-8290. The Parent Enrichment Program is designed to assist parents in their role as a child's first and most important teacher and to help promote a strong and healthy parent-child relationship. The program provides child development information and activity ideas brought to the home by a trained professional at the parents' convenience. In addition to the programs listed below, other activities include playgroups and parent workshops. For more information about our Parent Enrichment Program, call 815-599-7315 or email rdadezhepler@fhn.org. Learn about the national program at www.parentsasteachers.org. Car Seat Safety Checks: This program provides safety checks to ensure that child car seats are properly installed. Behavioral and School Intervention Program: This program works with young children, their parents, and their teachers to address behavior problems in preschool through six years old. Children are referred by school staff, healthcare providers, and parents. Philips Lifeline personal emergency response systems are available through FHN Volunteer Services. There is a cost for this service; it varies based on the system selected and shipping options for home delivery. For more information, call LIFELINE direct at 1-800-LIFELINE (1-800-543-3546) or email kbrooks@fhn.org. Philips Lifeline medical alert systems aren't just about falling. Having trouble breathing and need an ambulance? Locked out of the house and need someone with a key? The Top 50 Program provides information on health, wellness, prevention, stress management, and health screenings for those aged 50 and older. Top 50 regularly schedules blood pressure and cholesterol screens, flu shots, and support groups. Please contact us at 815-599-7437 or email jroach@fhn.org for additional information or to be placed on our mailing list. FHN is proud to be a part of Win With Wellness! 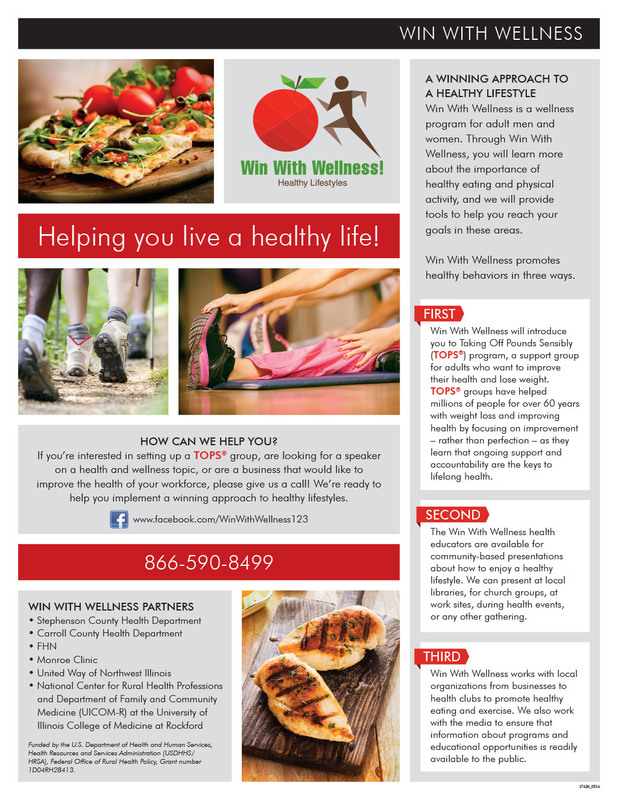 Win With Wellness is a community-based wellness initiative aiming to help people live healthy lives through better food choices and regular exercise. Participants learn more about the importance of healthy eating and physical activity, and tools are provided to help reach goals in these areas. Healthy eating behaviors are encouraged through the Taking Off Pounds Sensibly (TOPS®) program, a national weight-loss support group that's helped millions of people for over 60 years with weight loss and improving health by focusing on improvement, rather than perfection. Another element of Win With Wellness is the Heart To Heart program, where educators help participants build skills for healthier eating and getting more physical activity. The Win With Wellness team of healthcare and wellness specialists is available for community-based presentations about how to enjoy a healthy lifestyle. Presentations can be arranged at almost any time or location, including worksites. Businesses or groups interested in setting up a TOPSgroup or looking for a speaker on a health and wellness topic can call 1-866-590-8499 to arrange. As one of the Win With Wellness partners, FHN is pleased to be working with the Stephenson County Health Department, the Carroll County Health Department, the Monroe Clinic, the United Way of Northwest Illinois, and the National Center for Rural Health Professions and Department of Family and Community Medicine (UICOM-R) at the University of Illinois College of Medicine at Rockford to make this important wellness program a success!